Ideas for a royal blue wedding. Find blue flowers, dresses and more. Thinking of having a themed wedding in the color BLUE? Looking for blue wedding ideas? For 2011, BLUE was definately the color thanks to the British Royal Wedding; after all, it IS the traditional color to denote royalty. As Kate Middleton and William tied the knot on April 29th 2011, the highly anticipated British Royal Wedding made blue the color of the season! While tradition says the bride should wear something "borrowed" and something "blue," if your heart is set on a blue wedding theme, you will be more restricted on what's available in the color blue. Flowers, for instance, can be hard to find and your choice of blooms will be more limited, as not all are available in that shade. I've been searching for the best value royal blue wedding items online and here's what I've found. Just click on the links below for more information. Who says you can't get married in a blue wedding dress? My best friend did 25 years ago, before colored wedding dresses were even heard of! 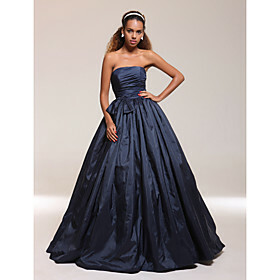 Simply gorgeous taffeta royal blue wedding gown with an A-line shape, tight fitting strapless bodice and a floor-length extravagant flowing skirt with a flattering bow trim at the waist. Wear on your big day and make use of it afterwards at a ball or other special event afterwards too! Here are some fabulous blue flower options and all at great wholesale prices too! Blue roses are unusual but very eye-catching. I love the almost iridescent shade of this one (you can see a larger picture at the top of page). Hamburg Blue hydrangea is a round shaped flower formed from clusters of small 4 point flowers. One single hydrangea bloom can make a stunning centerpiece when placed in a suitable container; use them to to make easy DIY bouquets. This hydrangea from California is a large, bushy flower with a stunning sea blue color and highlights of lilac-pink within the petals. Iris dark blue flower, an almost purple-blue toned bloom which is perfect for springtime. When fully open, you can see the bright yellow throats on the outer petals. Irises look stunning growing in the wild and are named after the Greek goddess of the rainbow. In cultivated form, the Iris has a graceful power that will be THE focal point in any wedding bouquet or flower arrangement. Tip: Mix and match your dress and flowers with white for a stunning combination for your royal blue wedding theme. Or think about other wedding color combinations like dramatic blue and orange or a more subtle combination of gentle blue and green.